When asked about how Trump conducts himself as president, 58% of Americans say they do not like his conduct; a quarter (25%) say they have mixed feelings, while 16% say they like the way he conducts himself. Large majorities across most demographic groups express negative views of the way Trump conducts himself. However, as with views of Trump’s overall job performance, there are sizable differences in these opinions. While about half of men (53%) and whites (51%) say they do not like the way Trump conducts himself, wide majorities of women (62%) and blacks (81%) and Hispanics (70%) say this. Younger adults are more likely than older adults to say they do not like the way Trump conducts himself as president. About six-in-ten of those younger than 50 (62%) say they don’t like his demeanor, compared with roughly half of those ages 65 and older (48%). There also is a wide educational gap in views of how Trump conducts himself. A 78% majority of those with postgraduate degrees say they do not like the way Trump comports himself, as do 64% of those with a college degree. Fewer of those with some college experience or less education rate Trump’s conduct negatively (53%). While Republicans generally take a much less negative view of Trump’s conduct as president than do Democrats, there are large differences in opinions among Republicans. Among Republicans and GOP leaners, conservatives are twice as likely as their moderate and liberal counterparts to say they like the way Trump conducts himself (42% vs. 21%). While just 10% of conservative Republicans say they dislike the way Trump comports himself, this rises to a third (33%) among moderate and liberal Republicans. And among Republicans 50 and older, 43% say they like the way Trump conducts himself as president, compared with 26% of younger Republicans. Republicans who do not have a bachelor’s degree are more likely than those who have graduated from college to say they like Trump’s conduct as president (37% vs. 27%). Overall, about as many Americans say intelligent (51%) describes the president very or fairly well as say it does not describe him too well or well at all (48%). Similarly, about half say decisive describes Trump at least fairly well (48%). On other positive traits, however, Trump receives lower marks. More say honest does not describe the president too well or not well at all (62%) than think it describes him fairly or very well (37%). An even higher percentage (72%) says the phrase “even tempered” does not describe Trump well; 26% say it does. Large majorities of Republicans and Republican leaners think intelligent (87%) and decisive (76%) describe Trump at least fairly well. And most Republicans (71%) also think the word honest describes Trump well. 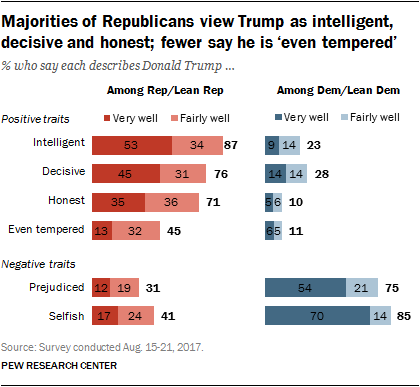 Trump receives much lower marks from Republicans for his temperament: Fewer than half say even tempered describes him well (45%); 53% say this phrase describes him not too well or not at all well. 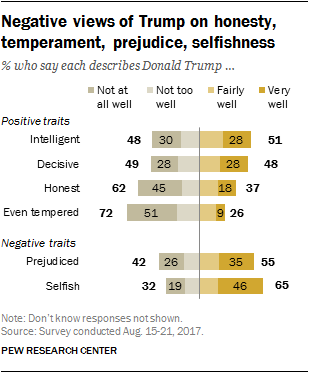 When it comes to negative traits, 41% of Republicans say the word selfish describes Trump well, while a majority (55%) say it does not. Even fewer Republicans (31%) characterize Trump as prejudiced; 65% say this does not describe him well. Majorities of Democrats say none of the four positive descriptors apply to Trump and that both negative terms describe him well. Still, nearly three-in-ten Democrats say the word decisive describes Trump well, while 23% say the same about intelligent. Three-quarters of Democrats say the word prejudiced (75%) fits Trump at least fairly well, including 54% who say it describes him very well. An even larger majority (85%) says selfish describes Trump very (70%) or fairly (14%) well. Overall, 15% of Americans say they tend to agree with Donald Trump on “all or nearly all” of the important issues facing the country, while another 18% find agreement with him on “many, but not all” issues. About two-in-ten (21%) say they agree with Trump on “a few” issues, and 45% say they agree with Trump on “no or almost no” issues. Nearly seven-in-ten Republicans and Republican leaners (69%) say they agree with Trump on many or all issues facing the country today, including 31% who agree with the president on all or nearly all issues. Still, three-in-ten Republicans say they agree with Trump on only a few (22%) or no (8%) issues. As with views of Trump’s presidential conduct, there are differences among Republicans in the extent to which they agree with the president on issues. Wide shares of conservative Republicans agree with Trump on many or all issues (78%), including 39% who agree with the president on all or nearly all. Moderate and liberal Republicans and leaners are less likely to be in agreement with Trump’s positions: While 53% say they agree on many or all issues, 46% say they agree with him on a few or no issues. In addition, those who identify as Republicans are significantly more likely than independents who lean to the GOP to say they agree with Trump on at least most issues (76% vs. 57%). Both Democrats and Democratic leaners overwhelmingly find little or no agreement with the president on issues. But among Democrats and Democratic leaners, liberals (86%) are more likely than conservatives and moderates (70%) to say they agree with Trump on no or almost no issues. The public has varying degrees of confidence in Trump’s handling of a range of specific issues. Half (50%) say they are very or somewhat confident that Trump can negotiate favorable trade agreements with other countries, while about as many (49%) say they are not too or not at all confident. There is a similar divide when it comes to Trump’s capacity to make good appointments to the federal courts. Nearly half (46%) say that they are at least somewhat confident he will make good appointments, while 52% say they are not too confident or have no confidence at all in his ability to make good appointments. 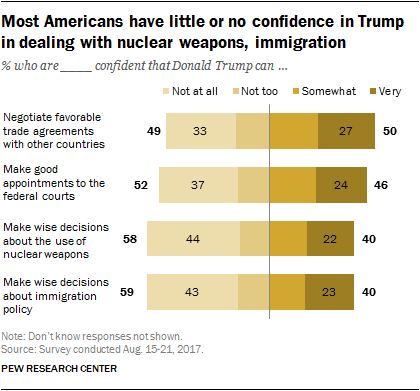 By contrast, 40% express confidence in Trump to make wise decisions about the use of nuclear weapons and about immigration policy. Majorities say they are not too confident or not at all confident in him on each of these issues (58% on nuclear weapons, 59% on immigration) including more than four-in-ten who say they are not at all confident in him on these issues. Across all four issues, Republicans and Republican leaners express far more confidence in Trump than do Democrats and Democratic leaners. However, Republicans are somewhat less confident in Trump’s ability to handle nuclear weapons and immigration than trade. While 56% of Republicans say they very confident that Trump can negotiate favorable trade deals, fewer express this level of confidence in Trump on nuclear weapons (47%) and immigration (50%). 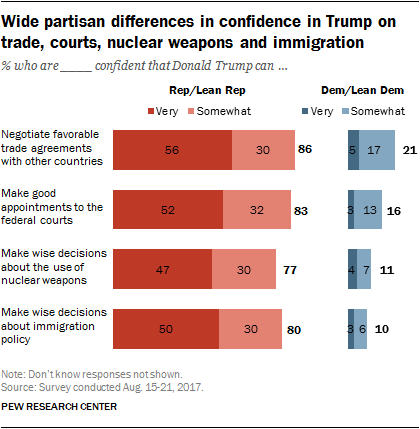 While Democrats are far less likely than Republicans to voice confidence in Trump, more Democrats say they are very or somewhat confident in Trump on trade (21%) than in dealing with nuclear weapons (11%) or immigration (10%). Republicans and Democrats are sharply divided on the issue. 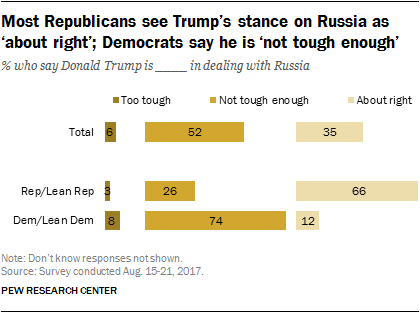 About three-quarters (74%) of Democrats think that Trump is not tough enough in dealing with Russia, while about two-thirds (66%) of Republicans say that he is handling Russia about right.